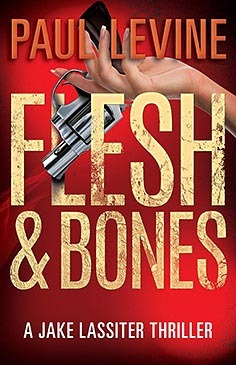 Flesh & Bones follows Lassiter as he fights his emotions in the case of Chrissy Bernhardt, a beautiful young model who’s in the dock for the murder of her father. Dozens of people saw her gun him down – but she claims it was because she’d just recovered repressed childhood memories of sexual abuse at his hands. Though Jake suspects that she’s fabricated the memories, or had them planted by a shady psychiatrist, he’s fallen for her – and it clouds his judgment. Is Chrissy an anguished victim or a cold-blooded killer? Jake’s search for answers leads him into a quagmire of dirty deals, big money and family corruption, all the while having no idea whether he’s being played by his own client. Flesh & Bones sees Lassiter’s ethics pushed to their limits as he battles with the dilemma of how far he’s prepared to go to set Chrissy free. Jake’s emotional side takes center stage in this gripping thriller, culminating in an explosive courtroom finale that will keep even seasoned thriller fans up late into the night.